The Cat's Paw Nebula is located among the dense star fields of the southern constellation Scorpius. Being about 5,000 light years distant, in the direction towards our galaxy's crowded central region, it appears visibly reddened by large amounts of interstellar dust that lie between us and the glowing cloud. This gives it a much warmer deep red hue than most other emission nebulae. Some other nebulae which are similarly obscured are the gigantic NGC 3603 in Carina, as well as NGC 6357 (The Lobster Nebula), also in Scorpius. 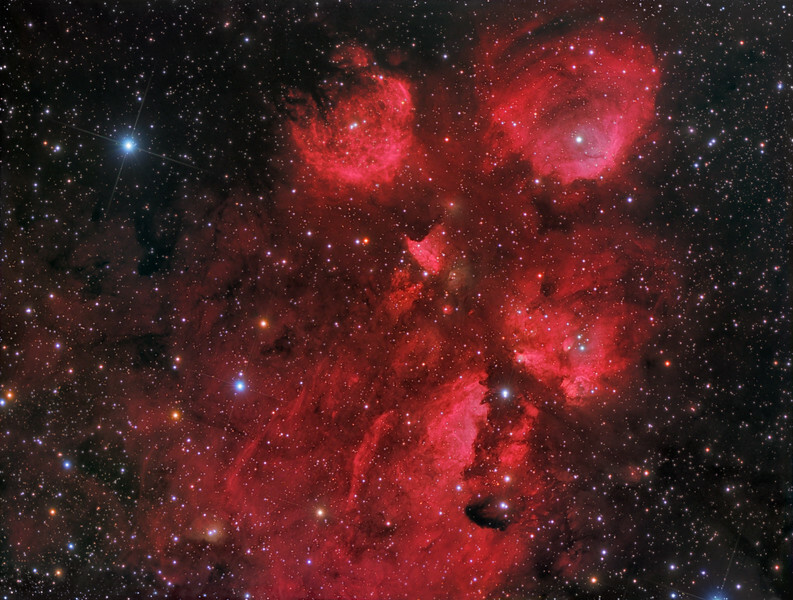 The Cat's Paw Nebula contains up to 200,000 solar masses of material and is currently undergoing a starburst; producing new stars at a very high rate. These newborn stars are the ones that light up the nebula and cause it to glow with the prominent red colour of hydrogen emission. The starburst activity will likely not last more than a few million years, after which a number of large star clusters will have emerged and replaced the once glowing gas. The nebula was first noticed by John Herschel in 1837 and its name refers to the distinct likeness with a giant feline paw print, particularly when viewed in wide field images. It is some 50 light years wide and covers an area in our sky equal to that of the full Moon.